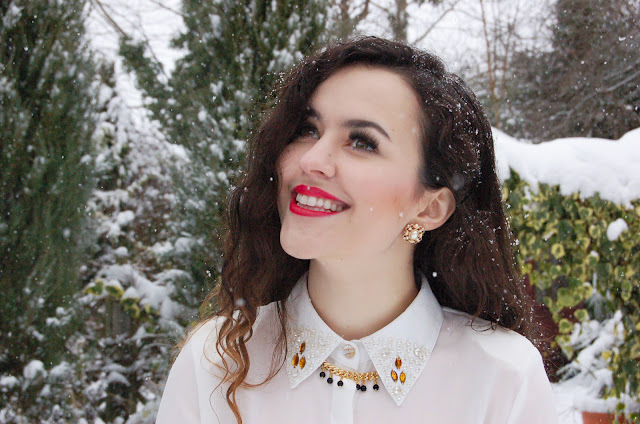 Arabella: Jewelled Collar / Embellished Pencil Skirt - Obligatory Snow Post! 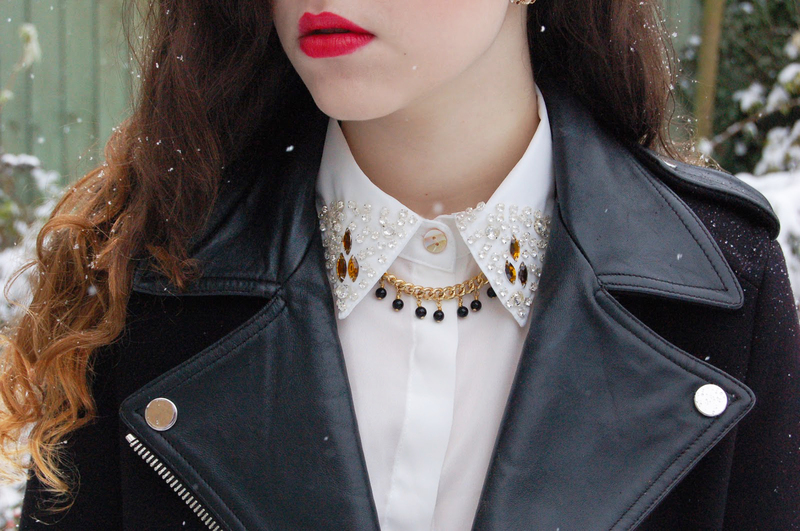 Jewelled Collar / Embellished Pencil Skirt - Obligatory Snow Post! I'm currently trapped inside due to the heavy snow and feeling like a caged animal. Unable to get to work or even leave the house in any sensible capacity (walking the poodle parade in the snow doesn't count.) I feel that perhaps I'm becoming an ill-tempered old grump, as this is the first year that the prospect (and consequent arrival) of snow has not excited me in the least. Blouse : c/o Dahlia. Necklace : c/o Cinderela B. Skirt : Virgos Lounge. Coat : ZARA. These photo's are the cutest! and I love your shirt! The detailing on the pencil skirt is so stunning!!! That blouse is gorgeous! I love the last photo, you look so cute! Oh my, that skirt is absolutely stunning. Words can't even begin to explain how much I love it's detailing! This skirt is absolutely gorgeous! You are gorgeous, the red lip is flawless! I looooove that Virgo's Lounge skirt, I've been so tempted to buy it. Looks perfect on you! absolutely stunning outfit yet again! Nothing like some heavy embellishment to make up for the cold weather! You look amazing! stunning stunning outfit! you look so classy it is not even funny and i love the red lips on you, girl! 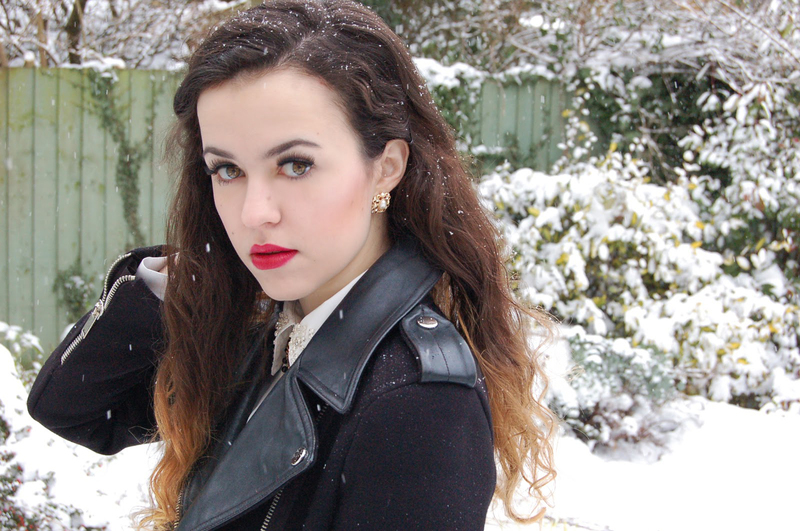 These photos are gorgeous and you are bloody stunning Arabella! I love this skirt so much and you've styled it so well. 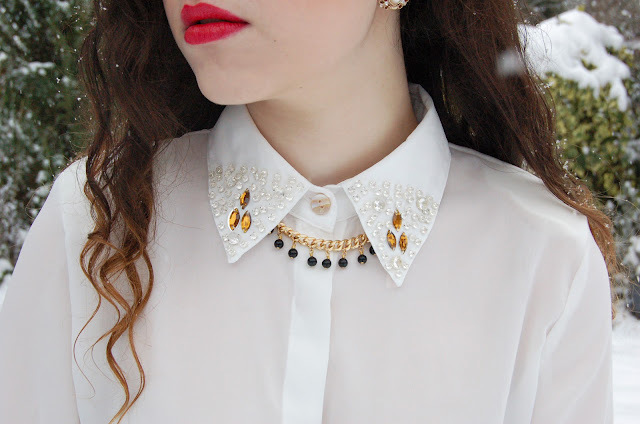 Love the collar on that shirt! gurrrl you are so gorgeous! That skirt is gorgeous! and I think you look a little like Drew Barrymore in the last pic! Your skirt is just fantastic - it's so intricate and beautiful! I really really love your lipstick! gorgeous outfit. Why must you look soo perfect all the time? :-) Gorgeous photos in the snow! Beautiful outfit and beautiful pictures! You look gorgeous, baroque loveliness personified! That skirt is a showstopper! The blouse is pretty perfect too! Wow, the detail on that shirt is beautiful. but nevertheless, stunning look and yay another one who's in for the black and gold look! I was so tempted to get the matching set! Very lovely details both on the skirt and on the shirt! You look stunning! The shirt is so cute, and your makeup is gorgeous! ahh the more i scroll through your blog the more and more outfits i fall in love with:) impeccable taste - ! that skirt is incredible! Oh my gosh, I want it so much!